"This is a great comfort food recipe that I love to make on a cold winter day. It is also a hit at our church's potluck dinners." Heat a large skillet over medium-high heat. Cook and stir beef, onion, green bell pepper, red bell pepper, and garlic in the hot skillet until beef is browned and crumbly, 5 to 7 minutes; drain and discard grease. Stir tomatoes, ketchup, brown sugar, mustard, salt, and pepper into ground beef mixture; reduce heat and simmer until heated through, about 10 minutes. Bring a large pot of lightly salted water to a boil. Cook corn in the boiling water until cooked through, about 5 minutes; drain. 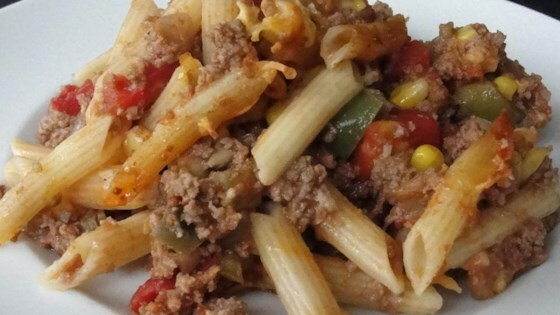 Mix corn, pasta, and Colby-Jack cheese into ground beef mixture; pour into a 9x13-inch baking dish. Bake in the preheated oven until heated through and cheese is melted, about 20 minutes.